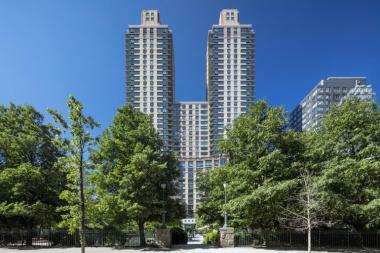 50 units are open in this Upper West Side high-rise as part of the city's affordable housing lottery. MANHATTAN — Fifty units are open in a West End Avenue high-rise through the city's affordable housing lottery system, but only for applicants making more than $70,000 a year. The West End Towers at 55-75 West End Ave., which is about a block from Lincoln Center, feature a concierge, complimentary shuttle bus, fitness room and children’s playground. The lottery runs from Aug. 2 to 31 and includes 32 studios for $2,024 per month, 15 one-bedroom apartments for $2,170 per month and three two-bedroom apartments for $2,611 per month. Prospective tenants who want to live in a studio or single bedroom need to earn between $70,732 and $94,250 annually, depending on whether they'll live by themselves or with someone else. Those who want a double bedroom need to pull in between $90,926 and $117,780 annually, again depending on how many people they'll share the unit with. The required income level for even the cheapest apartment in the building is above the area median income (AMI) of $60,500 for a single person and $86,300 for a family of four. AMI is used by the city to determine how much developers get in subsidies for a project. However, the apartments in the lottery are still cheaper than market-rate apartments in the building. According to the website of the building's owner, the Brodsky Organization, a studio is offered at $2,575, a one-bedroom goes for $3,050 and a two-bedroom is more than $4,000.